Can you imagine… a baby left on a train with a stranger? A newborn found in a latrine? A toddler abandoned in a marketplace? A tiny infant discovered at a cemetery? All these are true stories reported by our project partner in Lusaka, Zambia. Like Kenya and Uganda, Zambia has been ravaged by the AIDS epidemic. The paucity of medical services and government support for the poor has created a very hostile environment for children, making the need for our projects painfully obvious. House of Moses is a crisis nursery and home for abandoned, malnourished and orphaned children. The children they take in don’t have any other place to go – the mother often has died in childbirth or they might have been exposed by a desperate parent unable to care for the child - and are often in bad condition. At House of Moses the babies are nursed back to health without any high-tech medical equipment, but around-the-clock love and care instead. Almost all of them thrive, developing normally and growing strong and healthy. Since long-term a family setting is always preferable to an orphanage for the well-being of the child, our project partner works hard to reunite the healthy babies with extended family or find a loving adoptive family for them. They have saved countless children’s lives over the years and yet, the need is still great. "Last month at a small community church in Lusaka one of the parishioners slipped out of the service to the back of the church to use the outhouse. As she pulled the rough wooden door open, she heard a weak cry. Feeling the strength go out of her, she made herself look down the dark, putrid hole. Seeing movement and hearing another cry, the woman rushed back to the church to get help. The small building was quickly demolished and enough dirt removed from the top that a man could reach down and rescue the baby boy—weak but alive. 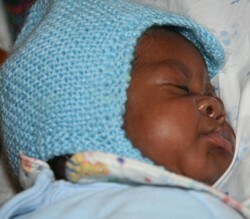 After a brief hospital stay, this little boy was brought to House of Moses. When we look at children through the eyes of Jesus, we see how unspeakably precious each one is. Jesus said if we give a cup of water to even one of the least of these children, we are giving it to Him. What a staggering fact! The little boy rescued from a pit latrine is safe and secure, flashing smiles at his caregivers and greedily gulping down his bottles. He will soon be adopted; the past forgotten and healed and the future expectant with hope and joy." For over 30 years our focus has been saving the lives of children by providing food, clean water, education, shelter, as well as medicines and medical supplies to those less fortunate. It is truly the generosity of our donors that allows us to make a difference in the world!